The Barbet is a very old French breed, being the ancestor of numerous modern breeds and types, such as the Poodle, the griffons, the Newfoundland and other water dogs, and the French sheepdog of the Brie region. The breed is a water dog, traditionally used as hunter’s assistant or as a sailor’s companion for fetching at sea. The female gave her name to the Barbette, the cannon posted, in the past, on the bow of ships. The Barbet was also used as a shepherd dog, for driving flocks, and as a companion dog. This is truly a versatile, multi-purpose breed. 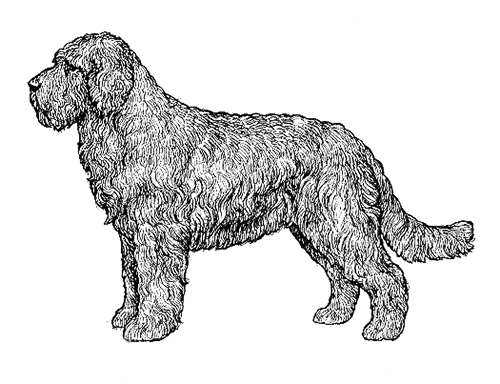 The Barbet was recognized by the United Kennel Club on January 1, 1995. The Barbet is a medium-sized, balanced dog, with characteristic thick, woolly, fleecy coat, assuring effective protection against cold and humidity. The length of the body, measured from the point of the shoulder to the point of the buttocks, is slightly more than the height at the withers. There is a characteristic beard, which gave the breed its name. The Barbet is not aggressive or timid, being docile and very devoted to its master. They are very sociable and fond of the water. The Barbet is essentially a water dog, used for wild fowling. Nevertheless, it has several abilities of a pointer/setter without being a true setter. The breed has no fear of the cold, going into water in all types of weather. Disqualifications: Viciousness or extreme shyness. Unilateral or bilateral cryptorchid. The head is entirely covered with long hair. Round and broad. The stop is pronounced. The forehead is large and short. The muzzle is very square and slightly shorter than the skull. The lips are thick and well-pigmented, the mucous membranes being black or brown. The jaws are of equal length. A full complement of strong, well-developed, white teeth meet in a scissors bite. Round in shape, preferably dark brown in color. Eye rims are black or brown. Low set, at eye level or slightly lower. Long, flat and broad. Covered with long, hanging hair that may form strands/cords. When brought together in front of the nose, the ears (including the hair) reach at least two inches (5 cm.) beyond it. The ear cartilage reaches further than the corner of the mouth. Faults: Ears set high (higher than eye level). Thin ears. Short ears. Narrow ears. Broad, with well-opened nostrils. Black or brown in color, depending on the color of the coat. Strong and muscular, with sloping shoulders. The upper arm is strong and muscular. The lower arm is straight and well-boned, completely covered with long hair. Faults: Fine bone. Fringed limbs. Lack of muscle. Broad, well-developed chest, reaching to the elbow. Solid back with a well-sustained topline. Loin is arched, short and strong. Seen from the side, the croup of round, in smooth continuation of the loin. Rounded ribcage, but not barrel-like. Faults: Dip in topline. Long, weak loin. Straight croup. Narrow chest. Well-developed and muscular, with good angulation. Rear pasterns are upright. Hocks set low and well-angulated. Faults: Lack of thigh muscle. No bend in the stifle. Lack of angulation in hock. Fringed limbs (spaniel-type). Dewclaws. The broad, round feet are covered with hair. Faults: Fine, narrow feet. Bare-pawed/uncovered (lack of hair). Set on low. Carried slightly raised. Carried above the horizontal when the dog is in action. Forms a slight hook at the tip. Faults: Tail set on high. Curved over the back. Lying on the crop or loin. Tail naturally absent. Tail too short. The thick hair, covering the body, is an essential characteristic of the breed. The coat is long, woolly, wavy, and curly, covering the whole body in a natural state. If not regularly brushed, the hair can form into cords. The hair on the head must fall down as far as the nose, and hide the eyes. The beard is long and thick. The mustache overlays the entire nose, and is very thick. Traditionally, the Barbet has been clipped to accommodate their work and lifestyle, therefore all clips are acceptable. Eliminating Fault: Short, harsh coat. Solid black, grey, brown, fawn, pale fawn, white, or more or less pied. All shades/hues of red-fawn and pale fawn are acceptable. Preferably, the entire body should be the same, uniform shade. Eliminating Fault: Any color other than those mentioned. Males - height ranges from 22¾ to25½ Inches, with a tolerance of one-half of an inch either way. Females - height ranges from 20¾ to 24 inches, with a tolerance on one-half of an inch either way. Easy movement, with the limbs moving in line with the body. The foreleg stride is medium, with good thrust from the hindquarters. Any color other than those listed.